This ornate ceramic incensario is finely crafted and has a serene presence. The incensario consists of the base, which is a container, and a lid, which is a figurative sculpture and adornos, mold made appliques. The central portrait mask has a pensive facial expression and large circular disc earrings. The mask is housed inside of a complex architectural structure flanked by ornate pillars and four decorative exterior panels. The structure, bearing a stylized feather adorno at top, is likely intended to resemble an actual temple or other sacred architectural space. The top consists of conical cover from which a chimney, or clay tube rises the full height of the back of the superstructure. It was once painted with bright orange, yellow, and blue pigments, which have faded through time but still remain as faint traces. Centrally placed at the forefront of the structure are two small icons that appear to be butterfly motifs. It is interesting to note that there is a similar incensario in the collection of the DeYoung museum in San Francisco that bears a strikingly similar butterfly motif, identified as such by the DeYoung curators. 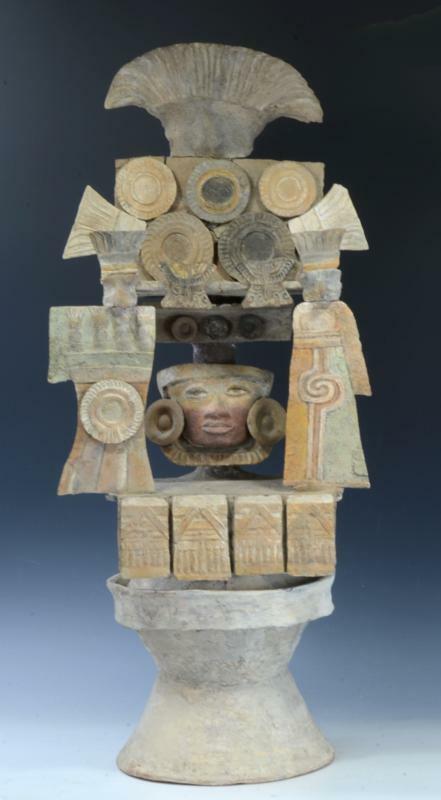 This incensario is from Teotihuacan, the famous ancient Mesoamerican city located north of Mexico city, known for its striking pyramid structures and the complexity of its city planning and civilization. This incensario likely would have been used as part of a religious ceremony in which the incense burned held a metaphysical significance. The inhabitants of Teotihuacan were believers in a cult of the cosmos that followed the imaginary battles of the Storm God, a feathered serpent deity, and the cyclical motions of the planet Venus. This was a cult of war and sacrifice, in which soldiers would routinely be sacrificed in the Temple of the Feathered Serpent. It was believed that the activities at the temple, including the sacrifices, would uphold the harmonic order of the cosmos and the well-being of Teotihuacans inhabitants. Restorations and repaired as seen in photos, the top and bottom have been glued shut; good ancient weathered surface. Ex Private NY Coll. See Teotihuacan: Art from the City of the Gods, by Kathleen Berrin and Ester Pasztory, published by Thames & Hudson, for the deYoung Museum in San Francisco in 1993, p.272.